I thought last month’s information about Freecycle’s Thursday lunches in Hackney and the embroidery with and Stitches in Time were great. I’m looking forward to seeing the finished tapestry, and wonder who will finish the bananas I started! We will pass on more information when we get it. April is looking busy, with Easter closely followed by our regular meeting and the first of our cake stalls for the year. More details are below. We have put together a list of the meetings and events we have planned for most of the rest of the year, and posted it on our website, click here. This is of course subject to change but I would highlight that May is our AGM and we will also be celebrating EEWI’s 10th Birthday, we plan to mark it with a more bountiful than usual feast of locally produced food. We will also have a competition for the best preserved work of art or curio produced at a meeting. It would be lovely if some of our past members could join current members to reminisce over old times and new. If anyone is interested in joining the committee please let us know. There is not too much work involved and it is always good to get new ideas. 18 April - Graham Barker, will be talking about walking around the East End. He is the director of Walk East, which offers guided and self-guided walks ranging the length and breadth of our area. 21 April - Coffee morning, from 10.30, at Kafe 1788, 4 Vesey Path, Poplar, London E14 6BT. 23 April - Museum of Childhood Cake stall, 11.30-4.30. Is our first fund raising event of the year and is often a good way of meeting potential new members and raising our profile. Help on the day and cakes are needed. 26 April - Tower Hamlets St. George’s Day Tea dance, held at the Art Pavilion, Mile End Park, 2-4.30. We usually have 2-3 people helping to set-up, serve tea & coffee and tidy up at the end. There are also tickets available for Tower Hamlets residents. 14 April - Deadline for the MFWI Denman Bursary Draw There are 2x£100 bursaries for courses held at Denman to be taken between 1 May 2017 and 30 April 2018. All entrants’ name, e-mail, full address and a contact telephone number must be received at Federation Office by 14 April 2017. If you can help or want more details for any of these events please let us know. 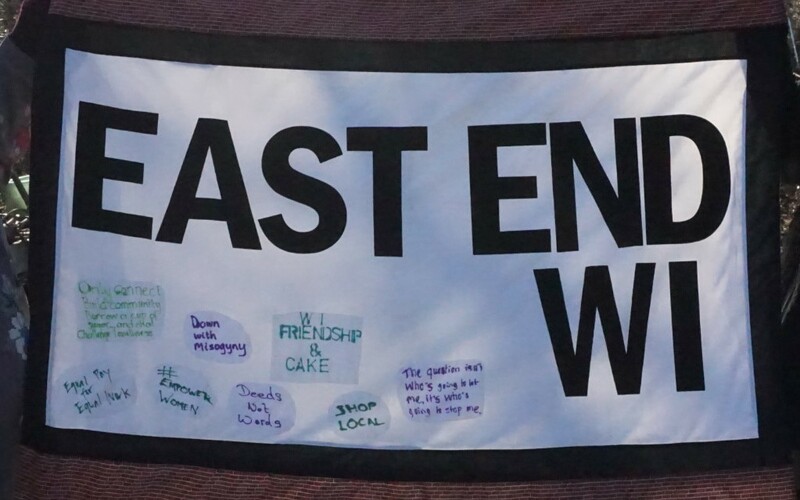 Please email eastendwi@hotmail.co.uk to confirm that you have joined/renewed so we can keep track of who has paid.